Tomatoes (Lycopersicon esculentum Mill.) are one of the major vegetables and second only to potatoes in terms of world production (FAO, 2011). While the majority of tomatoes are sold fresh, a little more than one third of the production is processed for canning, tomato juice, tomato paste or puree, sauces and ketchup (click here to see a diagram of Tomato processing). Pomace is the mixture of tomato peels, crushed seeds and small amounts of pulp that remains after the processing of the tomato for juice, paste and ketchup (Ventura et al., 2009). Tomato paste being the primary tomato product produced worldwide, tomato pomace is the main tomato by-product available for animal feed (USDA, 1994 cited by OECD, 2008). Skins (peels) are a by-product of the peeling of tomatoes used for canning. Skins can be removed by steam-processing, treated with liquid N or NaOH (Knoblich et al., 2005; Cotte, 2000). Tomato seeds are a by-product from the tomato cannery, notably from the production of de-seeded canned tomatoes (Cotte, 2000). In addition to the above by-products, the tomato industries also produces cull tomatoes, tomato leaves and tomato seed cake, which are described in their respective datasheets. Fresh tomato by-products have the same drawbacks as other high-moisture feed ingredients: they are costly to transport, they spoil quickly, their nutritive value per kg fresh matter is low and their bulkiness limits intake (Cotte, 2000). For these reasons, tomato pomace, skins and seeds are usually ensiled or dried before being fed to ruminants, poultry and other livestock. However, they may be particularly useful during dry periods when other feeds are in short supply (Poore, 2008). World tomato production was 152 million tons in 2009. The main tomato producers were China, the USA, India, Turkey, Egypt, Italy, Iran, Spain, Brazil and Mexico (75% of the world production) (FAO, 2011). More than a third of this production is grown for the processing industry, which makes tomatoes the world’s leading vegetable for processing (Tomato News, 2010). In 2007, tomato wastes were estimated to be 11 million tons, including a little more than 4 million tons of tomato pomace (FAO, 2011; Tomato News, 2010). The production of tomato pomace is seasonal and linked to the harvest period. Most of the product is available in the late warm-season and drying or ensiling is necessary for storage (Weiss et al., 1997). Tomato pomace and other tomato by-products are usually found in the vicinity of tomato processing plants, though dried tomato pomace is also exported. Tomato pomace and skins are high-moisture products: often more than 80% moisture and it can be up to 98% (NRC, 1983). They spoil very quickly, in less than 2 days in some cases (Caluya, 2000). Unless they can be fed immediately to livestock, they must be preserved either by drying or by ensiling. Due to the high moisture content, artificial drying can be expensive and sun drying is preferable. The product should be dried until it is crispy. Once dried, tomato pomace should be ground and the dried product mixed thoroughly with the diet (Caluya et al., 2003). Tomato processing by-products should not be ensiled alone. Their water content generates large quantities of effluents (Barroso et al., 2005) and pH does not decrease sufficiently for good preservation (Hadjipanayiotou, 1994). Consequently, it is recommended that a a dry material such as straw be added to absorb part of the juice (Barroso et al., 2005). When fresh tomato pulp (15.5% DM) is mixed with 5 or 10% wheat straw on a fresh basis, the end product, after 90 days, is a well preserved and fermented silage (Ziaei et al., 2010). In the Phillipines, Caluya et al., 2003 recommended mixing the fresh tomato pomace with chopped wilted grasses or a roughage, such as rice straw or maize stover, in plastic containers, or, alternatively, to pack the materials layer by layer (pomace then chopped grasses, etc.). The mixture should be approximately 69% pomace and 31% dry grass and the silage is ready after 14 days. Fresh tomato by-products have been considered an environmental nuisance for a long time (Rabak, 1917). In some countries, the waste is dumped in waterbodies near the factory or left to accumulate on the site of production. The material spoils quickly, emits a very foul odour and provides a breeding place for a variety of pests such as flies and mosquitoes, which are hosts of disease-causing organisms (Caluya et al., 2003). Feeding animals with tomato by-products is, therefore, a valuable way to prevent environmental contamination (del Valle et al., 2006; Caluya et al., 2003). Genetically modified tomatoes containing a gene preventing the accumulation of polygalacturonase, an enzyme involved in the ripening process, were released in the mid-1990s, first as fresh fruits and then as tomato paste. These products were eventually commercial failures and, after an initial success, the GM tomato paste was removed from the market in 1999. In 2011, no GM tomatoes were commercially available (Bruening et al., 2000; GMO Compass, 2006). Tomato by-products are highly heterogenous products. Their physical form, chemical composition and subsequent nutritional value depend on the relative proportions of peels, seeds and other remaining materials left by the various steps of the process, which themselves depend on the targeted tomato product. For instance, the crude protein and fat content of tomato pomace varies with the amount of seeds, which are richer in protein and fat than the peels (Denek et al., 2006). Tomato processing technologies and tomato products are also continuously evolving to meet market demands (Gasa et al., 1991; Knoblich et al., 2005; del Valle et al., 2006). The common names of the product (pomace, pulp, skins, seeds, waste, etc.) may be misleading and only a chemical analysis of the main nutrients (at least protein, fat and fibre) can give a proper idea of the nutritional value of a given batch. Tomato pomace is relatively rich in protein (17-22% DM) and fat (10-15% DM) (Feedipedia, 2011). Fat content can even exceed 20% if the seed proportion is high (Battaglini et al., 1978). Fibre content is high: crude fibre is in the 33-57% DM range. NDF (50-72% DM) consists largely of ADF (39-60%) (Feedipedia, 2011). Lignin content (ADL 20-30% DM; Feedipedia, 2011) is extremely important though some tomato pomaces containing less than 7% ADL in the DM have been described (Gasa et al., 1989; Fondevila et al., 1994). Tomato skins have a lower protein and fat content, and a higher fibre content than pomace (Battaglini et al., 1978; Knoblich et al., 2005). When NaOH is added to improve the efficiency of the mechanical peeling process, tomato skins have a very high Na content (can be more than 8% DM), which may limit the use of tomato skins in animal feeding. The high Na content must be taken into account in feed formulation. However, it is possible that NaOH treatment improves the nutritional value of tomato skins (Cotte, 2000). Tomato skins also contain appreciable amounts of carotenoids (about 500 mg/kg DM), mostly in the form of lycopene (Knoblich et al., 2005). Tomato seeds have a high protein (25-28% DM), fibre (54% ADF) and fat (20-24% DM) content (El Boushy et al., 2000; Persia et al., 2003). A tomato seed by-product containing a lower amount of fat is either misnamed or is actually a defatted seed meal or cake. Tomato pomace and skins contain tannins, which may limit their use for monogastrics (Kavitha et al., 2005). Unripe tomatoes and the green parts of ripe tomatoes contain tomatine, a solanine-like alkaloid (saponin) that may be toxic to insects, dogs, and to a lesser extent to herbivores, causing diarrhoea, vomiting and intestinal irritation. However, tomatine disappears as the tomato ripens and is not a problem in tomato pomace (Milner et al., 2011; Straney, 1998). Tomatine may have medicinal properties such as antibiotic, anticancer, anti-cholesterol, anti-inﬂammatory, antinociceptive and antipyretic eﬀects (Milner et al., 2011). Tomato by-products may be contaminated with chemicals such as insecticides, weed killer, etc. (Campos et al., 2007). The skins are directly exposed to these chemicals and pomace is thus prone to contamination. Maximum residue limits for food and feed are fully described in the Codex Alimentarius (Codex Alimentarius, 2011). Tomato by-products are usually fed to ruminants due to their high fibre content. They are not excellent feed ingredients, being less digestible than most major oil meal and protein sources. They can be bitter and should be used together with more palatable feeds. However, they can be a valuable and cost-effective source of protein, energy and fibre (Göhl, 1982; Caluya et al., 2003). In the Phillipines, Caluya et al., 2003 recommended including tomato pomace at up to 50% of the daily roughage requirement irrespective of whether it was fresh, dried or ensiled. The pomace should be given before the roughage or mixed (particularly when dry) thoroughly with chopped roughage. In vivo OM digestibility of dried tomato pomace was estimated at 56% in sheep, using a balanced diet containing 34% pomace. In sacco rumen DM degradability was 48% (Abbeddou et al., 2011). A value of 62% for OM digestibility was obtained using the gas test method. Extremely wide estimates of ME have been obtained, depending on the method (in vitro, in sacco) and equation used, ranging from 4.9 (Chumpawadee et al., 2007), 7 and 9 (Gasa et al., 1991; Abbeddou et al., 2011), to 11.8 MJ/kg DM (Aghajanzadeh-Golshani et al., 2010). In sacco protein degradability of dried tomato pomace in the rumen is quite high, from 65-70% (Chumpawadee, 2009; Abbeddou et al., 2011) to 76-78% (Ben Salem et al., 2008; Valizadeh et al., 2009). However, most of the protein is not digestible in the rumen but in the intestine (Gasa et al., 1988; Gasa et al., 1991, Ventura et al., 2009), probably because an important fraction of this crude protein is acid-detergent insoluble (Weiss et al., 1997; Ventura et al., 2009). Tomato pomace ensiled with whole maize plant at up to 12% (DM basis) showed good preservation characteristics. Dairy cows fed this silage had the same DM intake (3.74% BW), milk yield (35 kg/d) and milk composition as cows fed maize silage alone (Weiss et al., 1997). In lambs, fresh tomato pomace replaced more than 75% of poor quality hay (6% protein and 43% OM digestibility), resulting in higher OM intake and OM digestibility (Ojeda et al., 2001). Fresh tomato pomace ensiled with 10% (Denek et al., 2006), or 15% straw (Barroso et al., 2008) on a DM basis, was well preserved. When offered as sole forage to 43 kg Awassi rams (Denek et al., 2006) or 47 kg Segureña ewes (Barroso et al., 2008), for maintenance, DM intake was 0.95 kg/d (Denek et al., 2006) and 1.7 kg/d (Barroso et al., 2008) with a little daily weight gain of 50 g/d (Barroso et al., 2008). It can be concluded that fresh tomato pomace ensiled with straw can be a good quality roughage for sheep, particularly during periods of forage scarcity (Denek et al., 2006). Ensiled tomato pomace (20% DM) can be fed to castrated lambs (43.5 kg) at up to 45% of the diet DM and replace maize silage without modifying total DM intake (91.7 g/kg W0.75). However, OM digestibility of the diet significantly increased at up to 30% replacement but not beyond (Campos et al., 2007). In dairy cows in early lactation (41 kg milk/d), dried tomato pomace included at 10% of the diet DM did not change DM intake, milk yield and milk composition (Safari et al., 2007). In multiparous dairy cows (26 kg milk/d) dried tomato pomace was included at up to 32.5% of the concentrate DM, replacing part of barley grain and whole cottonseed meal without any adverse effect on health, milk yield and DM intake (Belibasakis, 1990). In beef heifers, dried tomato pomace completely replaced urea-treated straw, improving rumen digestion and feed efficiency. DM intake increased from 66 (straw only) to 121 g DM/kg BW0.75 (70% pomace) and decreased slightly (97 g DM/kg BW0.75) when pomace was fed alone (Yuangklang et al., 2006). In Brahman-Thai steers (188 kg), dried tomato pomace was included at 50% of the diet DM in a total mixed ration without any problem. Diet DM intake (103 g/kg BW0.75) was comparable to that obtained with other by-products (brewers grains, palm kernel meal and soybean meal) included at the same amount in the diet (Chumpawadee et al., 2009). In adult steers (370 kg) fed for 21 days a total mixed ration where dried tomato pomace replaced cassava chips (up to 11% of diet DM), there were no significant changes in DM intake and nutrient digestibility (OM, protein and fibre) (Yuangklang et al., 2010a). In two-year-old Brahman steers (258 kg) fed for 120 days, the replacement of cassava by tomato pomace tended to reduce daily weight gain (from 1037 to 881 g/d), but differences were not significant (Yuangklang et al., 2010b). In adult rams, a diet containing dried tomato pomace and alfalfa hay in a 1:1 ratio resulted in digestibility of DM, OM and crude protein being 57, 59 and 57% respectively. An addition of yeast (4 g/d) significantly increased digestibility up to 68, 67 and 66% respectively (Paryad et al., 2009). In growing lambs (18 kg), an experiment compared ad libitum straw-based diets supplemented with 500 g concentrate (control), or with 250 or 125 g concentrate and feed blocks containing wheat bran, salt, minerals and 48% (DM) of dried tomato pulp. DM intake of the feed blocks + 125 g concentrate was higher than for the other treatments. The DM intake of feed blocks increased (37.5 to 48.7 g/kg W0.75) when the DM intake of offered concentrate decreased (23.1 to 11.9 g/kg W0.75). Growth with the feed block was not significantly different from that of lambs fed straw and concentrate. Growth tended to decrease (57 to 48.7 g/d) when the concentrate offered decreased (Ben Salem et al., 2008). In fattening lambs fed an alfalfa hay-based diet, dried tomato pomace included at up to 75% decreased OM digestibility from 66% to 57% respectively. Daily weight gain was highest (132 g/d) at a 50% inclusion rate, which was, therefore, the maximum recommended rate (Ibrahem et al., 1983). Young growing lambs (15.6 kg) fed for 6 weeks on a barley-based diet with 200 g/kg DM of dried tomato pomace had a similar N retention and growth performance (304 vs. 337 g/d) as lambs fed on a diet containing the same level of protein from soybean meal (Fondevila et al., 1994). In growing sheep (6-7 months old, 32.6 kg), dried tomato pomace replacing 50 or 75% of sunflower meal protein significantly decreased DM, crude protein and crude fibre digestibility and it was concluded that 12.5% was the maximum replacement rate for dietary protein (Mohamed et al., 1997). In goats fed Napier grass ad libitum for 21 days, dried tomato pomace replaced 25 to 100% of soybean meal offered at 1.5% BW without changing forage intake (0.535 kg DM/d), concentrate intake and N utilization (Yuangklang et al., 2007). While tomato wastes have been described as potentially useful for non-ruminants (Gupta, 1988), there is scarce information concerning the use of tomato pomace, skins and seeds in pig feeding. In the Phillipines, fresh tomato pomace was found to have potential as a supplementary feed for grower and finisher pigs. Feeding growing pigs with 6% fresh tomato pomace significantly increased feed consumption compared to those fed a commercial mash. Furthermore, feed cost per kg gain was reduced. Including 35% fresh pomace in the diet of finishing pigs resulted in a significantly higher final weight, total weight gain, average daily gain and feed consumption. Feed efficiency was comparable to those fed commercial mash and feed cost per kg gain was significantly decreased with increasing levels of fresh tomato pomace (Caluya et al., 2000). In growing pigs fed isonitrogenous diets containing 4 and 8% dry tomato pulp with or without enzymes, nutrient digestibility (DM, OM, protein and crude fibre) was significantly reduced with an 8% inclusion rate compared to 4%. Adding a mixed enzyme preparation (amylase, protease, cellulase) to the rations containing 8% tomato pulp resulted in increasing DM and crude fibre digestibility to the levels of the 4% tomato pulp diet, but not the OM and protein digestibility (Imamidou et al., 1999). In growing and fattening pigs fed maize-based diets, the simultaneous inclusion of by-products of tomato, grape and pepper (2% inclusion rate of each, replacing in total about 10% of the maize grain of the control diet) did not have any negative effects on performance and health (Cilev et al., 2007). Dried tomato pomace can be used in poultry feeds, but its high fibre limits the metabolizable energy (ME) content to 8.4-9.5 MJ/kg (Kavitha et al., 2005; Lira et al., 2011) and thus its practical use in poultry feed formulation. Inclusion of dried tomato pomace in broiler diets is possible if taking into account its low energy value in feed formulation. A lower feed intake has occasionally been observed in young animals, which is probably due more to the higher fibre content than to a low palatability, since older animals can consume diets with high pomace levels (Lira et al., 2010). However, growth performance and feed efficiency have been depressed even at low inclusion rates in some instances (3% in starters to 9% in finishers; Tabeidian et al., 2011). Increasing inclusion rates from 5 to 20% decreased performance linearly with a relatively small (6%) overall decrease in body weight at 20% inclusion rate. Young animals were more affected, and birds older than 28 days did not show a lower growth when 20% pomace was included in the diet (Lira et al., 2010). Carcass characteristics do not appear to be negatively influenced by dried tomato pomace (Lira et al., 2010). The lycopene content could actually be an advantage, especially in hot climates, due to its antioxidant properties (in quail: Sahin et al., 2008). Several treatments have been proposed in order to improve the nutritive value of dried tomato pomace in poultry. No significant differences were found between heat treatments (hot air at 121°C vs. sun drying) and soaking in alkali, and after these treatments a 10% inclusion rate of pomace in the diet increased performance (Al-Betawi, 2005). An enzyme treatment (enzyme cocktail) failed to improve broiler performance (Tabeidian et al., 2011). In conclusion, for optimal performance dried tomato pomace should be avoided in very young animals. It can be recommended at up to 5-8% of the diet for growers and up to 10-12% for finishers. Inclusion rates as high as 20% can be used after 4 weeks of age if the feed is well balanced in energy, but growth and feed efficiency could be reduced. For slow-growing chickens, dried tomato pomace can be a realistic option. Dried tomato pomace was included successfully in diets for layers, which require a lower energy concentration than broilers (Dotas et al., 1999). It can be used as a substitute for wheat bran, which has a similar energy content (Mansoori et al., 2008). At inclusion rates below 10%, no effect on performance was recorded, while higher levels occasionally depress egg production (Jafari et al., 2006). However, in some experiments, levels of 16% to 20% pomace were tested without effecting egg production and body weight (Yannakopoulos et al., 1992; Calislar et al., 2010). No major effect was found on egg weight, structural characteristics (Calislar et al., 2010; Dotas et al., 1999) and overall quality (Nobakht, 2007). Because of the pigment content of dried tomato pomace (lycopene, carotenoids), egg yolk color was enhanced by its inclusion in the diet (Calislar et al., 2010; Dotas et al., 1999). Tomato extract could replace alfalfa extract for pigmentation of eggs (Karadas et al., 2006). Dried tomato seeds have a much higher energy level than dried tomato pomace (more than 12.6 MJ/kg DM) due to their high fat content. Tomato seeds tested in the diets of chicks (8-21 days of age) resulted in a similar performance as a control diet up to 15% inclusion, but at 20% growth was slightly reduced (Persia et al., 2003). Dried tomato pomace is a valuable ingredient for feeding rabbits. It is one of few products that are simultaneously rich in digestible energy (13.7 MJ/kg; Gippert et al., 1988), mainly as a consequence of the high lipid content, rich in digestible protein (71-74% digestibility; Battaglini et al., 1978; Gippert et al., 1988) and also rich in fibre, particularly lignin, important in the control of digestive diseases in the rabbit (Gidenne et al., 2010). For rabbits, the protein of tomato by-products is rich in lysine (about 7.7 g/16 g N, with a recommendation of 4.5 g), well-balanced in total sulphur-containing amino acids (4.1 g/16 g N, with a recommendation of 3.75 g) but is deficient in threonine (Gippert et al., 1988). For growing rabbits, dried tomato pomace has been introduced in the diet up to 20% without any problem (Gippert et al., 1988; Rojas et al., 1989; Sayed et al., 2009). Depending on local conditions, it can replace alfalfa (Alicata et al., 1988) or maize grain in the diet (El-Razik, 1996). In a carefully formulated diet, the inclusion rate of dried tomato pomace could be increased at up to 24-30% without significantly reducing performance (Gippert et al., 1988; Waheed, 2005; Sayed et al., 2009). The lipids of dried tomato pomace are rich in C18:2 (56.9% of fatty acids) but poor in C18:3 (2.3%). As a consequence, the fat of rabbits fed a diet containing tomato pomace had a higher proportion of C18:2 n-6 and a lower proportion of C18:3 n-3 than the fat of rabbits fed an alfalfa-based diet (Alicata et al., 1988). 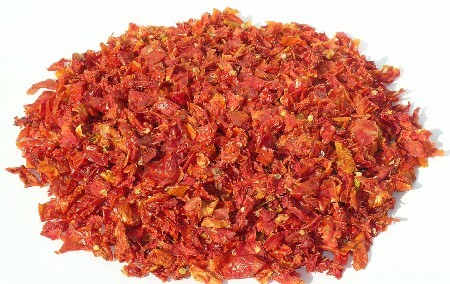 Dried tomato pomace could also be used for feeding breeding rabbits. For example a diet containing 20% dried tomato pomace replacing dehydrated alfalfa was fed to breeding does for 8 months without any problem (Alicata et al., 1988). Dried tomato skins obtained from canneries were included in the diets of growing rabbits at up to 20%, but it should be noted that OM and protein digestibility were low, at 36.9% and 51.4% respectively (Battaglini et al., 1978). Dried pomace is sometimes used in pet food and for fur-bearing animals. Tomato pomace has been used in dog feeds, and fox and mink diets (dry pomace at 5% of wet ration) to prevent diarrhea (NRC, 1983). Caluya, R. R. ; Sair, R. R. ; Balneg, B. B., 2000. Fresh tomato pomace (FTP) as good feed for growing and fattening pigs. PCARRD Highlights '99: summary proceedings. 143 p.
Cotte, F., 2000. Study of the feeding value of tomato pulp for ruminants. Thèse, Ecole Nationale Vétérinaire de Lyon, Université Claude Bernard Lyon 1, Thèse n° 171, 142 p.
Gasa, J. ; Castrillo, C., 1991. Criterios de utilizacion de subproductos agroindustriales en la alimentacion de rumiantes. Hojas divulgadoras, n° 13: 24, Ministerio de Agricultura Pesca y Alimentacion. Instituto Nacional de Reforma y Desarrollo Agrario. Direccion Generale de Infraestructuras y Cooperacion. Madrid, Espana.